Did you know that more than 70% Australian mobile phone users use smartphone devices? This is indeed a big proportion. With the rise of smart mobile devices, the importance of mobile application is also growing. The increase in the popularity of mobile apps is staggering. It would be such a waste if you didn’t grab the opportunity to expand your business by getting a superb mobile app developed to attract more customers. Our mobile application development solutions will help your business excel beyond digital heaven. With the power to stay up close and personal with target audiences, your brand will have an extensive reach in the marketplace than ever before. 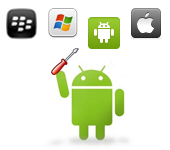 Contact us with your requirement and know how we can help with the excellent mobile app development solution.